An invoice, sometimes called a sales invoice, is a document sent by a provider of a product or service to the purchaser. The invoice establishes an obligation on the part of the purchaser to pay, creating an account receivable. In other words, the invoice is a written verification of the agreement between the buyer and seller of the goods or services. Invoices are an important part of your business's bookkeeping and accounting recordkeeping system because they record sales transactions. The date that the invoice was created. Don't forget this. The date of the invoice starts the clock ticking on the customer. If you have terms (a time limit for payment), you want to include the date so everyone knows when the payment is due. Names and addresses of customer and supplier. If you're creating the invoice in accounting software, you may only need the email address of the customer, but it's still a good idea to collect and include the physical address, in case you need to send a real letter or document. Contact names of individuals at the two businesses (or business and individual). It's a good customer relations rule to make sure you spell names correctly. Description of items purchased, either products or services, including prices and quantities. Often you will have standard item descriptions and inventory numbers. But be as specific and detailed as possible, when you create the invoice. This avoids confusion and "I didn't know" issues. Terms of payment. For example, the provider might specify "net 30 days," which means that the entire amount is due within 30 days. You may be using online business accounting software, or maybe you are using a pre-printed invoice that you will complete. The process works the same way for both invoicing processes. You will prepare an invoice only after you have shipped or delivered the product or service to the customer. Start by identifying the customer. In some cases, you may also want to identify a sub-customer or job within that customer's file. Include previous document numbers related to this sale, including any purchase order or sales agreement or estimate. Identify the items sold and delivered. Usually, you would include the name of the product or service, quantity (or time, for services) and rate (per item or per hour). If you are using online software, the total for each item is calculated. This is the place where you might need to classify an item as "back ordered." Each item gets its own line, and the total of all lines is added. Next, you will include information any deposits already made by the customer or any discounts applied to this invoice. You may want to offer customers different payment methods, possibly giving a discount for paying in cash. Include the shipping terms for products shipped. There are two types: FOB shipping point or FOB destination. (FOB stands for "free on board.") If the terms are FOB shipping point, the shipper (that's the seller) pays the shipping. If the terms are FOB destination, the buyer pays the shipping. It's also a good idea to note if the customer picks up the item or items, in case there is any question about the item being received. Include the terms of sale. That is, when do you want the buyer to pay and will you give any discount for early payment? The terms are expressed like this 2/10 Net/30. That means you will give a 2% discount if payment is received within 10 days, and the entire balance is due in 30 days. Invoices may be mailed or emailed or faxed to a customer. When a customer pays, the invoice number should be noted on the sales receipt and matched to the sales receipt in your accounting software, so it's clear that the invoice has been paid. The payment takes the outstanding amount out of your accounts receivable account. Invoices are sometimes confused with purchase orders. Purchase orders (POs) are before the transaction, and invoices are after the transaction. Purchase orders record an order by a customer to a vendor or supplier. An invoice, on the other hand, records the receipt of the product or service and, as noted above, the terms of payment. Purchase orders are used by many companies as part of an approval process. Some companies require purchase orders for products or services over a specific amount. The difference between an invoice and a bill is the focus and standpoint. The invoice is created by a supplier, and it is a statement of services or products produced and delivered to a customer, including the amount owed. An invoice may be created before or after the product or service is received. It's common for an invoice to be included with products being delivered, so the recipient can check off the items to make sure they are all there. A bill is a request for payment. A bill is usually considered from the customer's standpoint. It's common to receive a bill without an invoice, as in a restaurant or retail store. A bill is usually given with the expectation of immediate payment. This sample invoice includes Canadian information, but it will give you an idea of what an invoice includes. 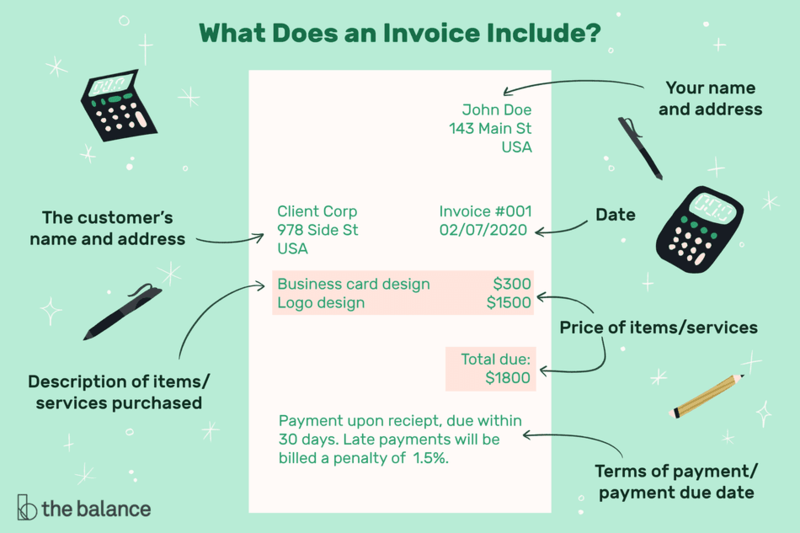 Here are some step-by-step directions for creating an invoice.